U.S. 212 runs from the Northwest (Silver Gate/Cooke City) Entrance of Yellowstone National Park, Wyoming, east to U.S. 169 in the Minneapolis, Minnesota, metropolitan area. U.S. 212 enters Wyoming twice, once near Yellowstone National Park as part of the Beartooth Highway and again near Colony, Wyoming, between Billings, Montana, and Belle Fourche, South Dakota. U.S. 212 crosses the Beartooth Pass at 10,940 feet, which makes U.S. 212 one of the highest state routes in Wyoming. U.S. 212 is State Control Route P-48 in Crook County, while the section of Beartooth Highway is maintained by the National Park Service rather than the State of Wyoming (even though it is recorded as State Control Route P-38 in WyoDOT records). Signage and mileposting along U.S. 212 between Cooke City and Red Lodge is consistent with the WyoDOT standards. U.S. 212 was not one of the original 1926 U.S. highways. At that time, the Beartooth Highway was unconstructed. Montana 32 left U.S. 310 toward Cooke City, but did not make it. Upon completion in 1936, the Beartooth Highway was soon bestowed with the U.S. 12 designation. This lasted for about twenty years. In 1960, U.S. 12 was rerouted via old U.S. 10N across central Montana. When this happened, what was once U.S. 12 via the Beartooth Highway was recommissioned U.S. 312, from Yellowstone to Miles City. U.S. 312 lasted as the designation of the Beartooth Highway for about two years; in 1962, U.S. 312 was redefined to run from Billings to Broadley via U.S. 10 and Montana 59. It was that same year that the Beartooth Highway was recommissioned U.S. 212, a highway that previously ended at U.S. 87 near Custer Battlefield National Monument south of Billings. U.S. 212 merged with U.S. 87 into Billings, U.S. 10 between Billings and Laurel, and U.S. 310 for a short distance south of Laurel. Then U.S. 212 was routed southwest into the Beartooth Mountains. Its official end is just west of Cooke City, when the highway enters Yellowstone National Park. The Grand Loop Road meets the connection to U.S. 212 at the northeast corner of the loop. As for the Colony section of U.S. 212, it was not commissioned until 1939. Prior to 1936, that segment of U.S. 212 was either unmaintained or maintained locally. Between 1936 and 1939, it became part of the state highway system as Wyoming 414. Then in 1939, it became part of U.S. 212, which was extended from its old western terminus in Belle Fourche all the way to Billings. U.S. 212 would not be extended again until 1962, when it was commissioned over the Beartooth Highway. U.S. 212 begins its easterly journey at the northeastern entrance into Yellowstone National Park. It is arguably the most scenic entrance into Yellowstone, but each entrance has its own scenery. U.S. 212 follows the nationally acclaimed Beartooth Highway from Yellowstone into Montana, and it has some of the most beautiful and awe-inspiring views in the West. The late Charles Kuralt of the old CBS-TV show "On The Road" considers U.S. 212 (The Beartooth Highway), along with the "Going to the Sun Road," as two the most scenic roads in the nation. The Beartooth Pass on U.S. 212 rises to an elevation of 10,947 feet. This road has switchbacks and treacherous turns everywhere. There are few guardrails - the responsible departments of transpotation can't put them in because the road clings to the side of the mountain. At the end of this journey, travelers arrive in Cooke City, Montana, which is the gateway town closest to the northeastern entrance to Yellowstone National Park. Throughout this journey, U.S. 212 jumps back and forth between Wyoming and Montana. 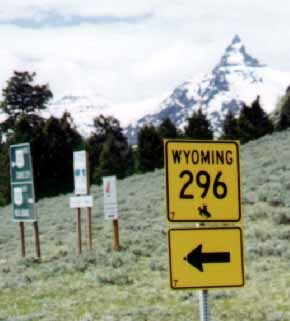 The Chief Joseph Scenic Highway, Wyoming 296, has its northern terminus on the Wyoming section of U.S. 212 (Beartooth Highway). This is part of the longest stretch of U.S. 212 within the Equality State. U.S. 212 returns to Wyoming in the northeast corner of the state in a much less dramatic fashion. Located near Colony, U.S. 212 is merely a connector route between Billings and Belle Fourche, without much connection to the rest of the state of Wyoming. Wyoming 112, a Crook County secondary state route, connects U.S. 212 with Wyoming 24 and U.S. 14, but Wyoming 112 connects to U.S. 212 via Montana 326 in Alzada. This corner of Wyoming is among the lowest in elevation in the entire state, with elevations around 3,500 feet. Compare that to 10,947 feet! Westbound U.S. 212 approaching Wyoming 296, the Chief Joseph Highway. Photo taken by Greg Coniglio, 1998. 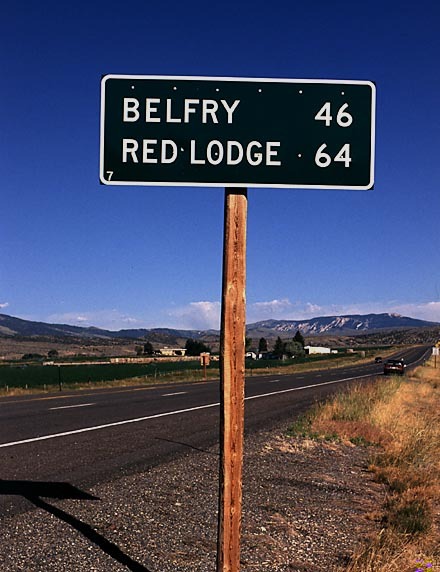 Eastbound U.S. 212 mileage sign to Belfry and Red Lodge. Photo taken by Jonathan Winkler, 8/00. Page Updated July 11, 2002.